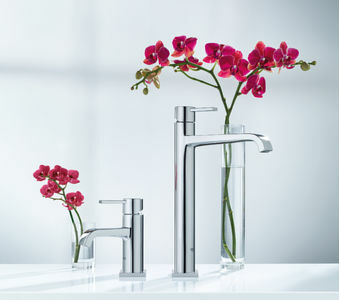 For years, GROHE offered a wide range of taps and mixers in different designs. Now, GROHE offers an additional comfortable advantage – the choice of sizes. GROHE now puts the luxury of choice in your hands. Sleek, smooth and cylindrical? The sharp, dynamic lines of a cube? A tactile faucet that is a delight to touch? Whatever look is the perfect fit for your bathroom, GROHE can offer you an unrivalled choice of size. Once you have chosen the design of the GROHE bath range you like, you can pick the faucet size to suit you and your family‘s needs. Whether you need a pillar tap or a faucet so your children can wash their hands more easily, the right product is available to offer the utmost comfort.